Sorry guys this is not about the underwater but the topside world. Its about carrier cycles, bringing up kids and a litte more. Bicycle carriers used to be a popular and cheap way of transportation in Asian countries. In Indonesia they were very popular in colonial times when poor coolies (unskilled workers doing hard labour for little money) transported their passengers in two seaters also called betjaks through the busy streets. I remember once sharing a betjak with my mother coming back from the market, not feeling very much at ease with the gasping driver behind us. The betjaks are now banned from most of the the cities. Which raised a lot of protests from the drivers who became deprived from their income. Interestingly in modern times the carrier cycle or ‘bakfiets’ in Dutch has become a fashionable way of transportation in the bigger cities. But the new ‘coolies’ are now healthy young middle class women who enjoy using the bakfiets to transport their kids to school (and concurrently loose some calories). Some of these bikes, the electrical upgrades (called City or Cargo Cruisers) are pretty expensive and may cost even more than 2000 Euro. 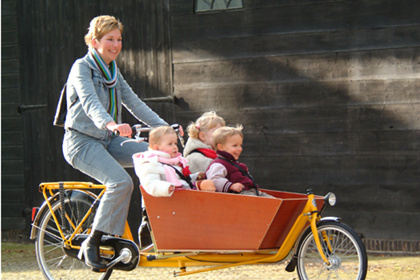 The bakfiets is often equipped with nice seats and a small rainshield in case the vehicle is surprised by a rain shower. The kids also seem to enjoy it and happily chat with one another, or with other kids when several bakfietsen are lined up before the traffic lights. They are like little princes or princesses carried around in their private chariots, while mummy is doing the hard work. Dutch children in general enjoy a liberal education. Many modern parents want their lives to be smooth and happy, and do not bother very much about rules or restrictions. Punishing a child for its bad behavior is not considered good practice in modern education. In fact, libertarian upbringing in Holland goes back a long time. Just look at some paintings of the famous Dutch family painter Jan Steen who lived in the 17th century. Educational experts are divided in their opinion: some believe that bringing up a chid in a free environment with little restrictions is a good basis for developing a childs self confidence and even building up its future harmonious relations. This of course goes back to the disputed ideas of free education of Jean Jacques Rousseau. Others however are more sceptical and feel that kids shoud learn to cope with frustrations to deal with eventual misfortunes in later life. So letting them always decide for themselves might not be such a good idea at all, if one has not yet learned what is right and wrong. Children are primarily pleasure seekers. And we cant blame them for that.